A Joppa couple managed to escape from their burning home after being awakened by smoke detectors on Saturday. Deputy State Fire Marshals credit the life-saving devices for allowing the husband & wife to escape the blaze. 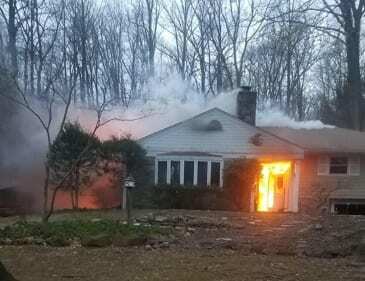 The Office of the Maryland State Fire Marshal says the occupants were in bed and awoke to the sound of their smoke alarms early on Saturday morning. They quickly discovered a fire in the basement of their home on Timber Lane. The couple attempted to put out the fire with a portable fire extinguisher and all-purpose baking flour, but the flames quickly spread beyond their control. Both were able to escape but their two cats died in the fire. It took crews from multiple fire companies about an hour to extinguish the blaze. The home and all contents were considered a complete loss by investigators. Friends and the Red Cross are assisting while the couple is displaced.